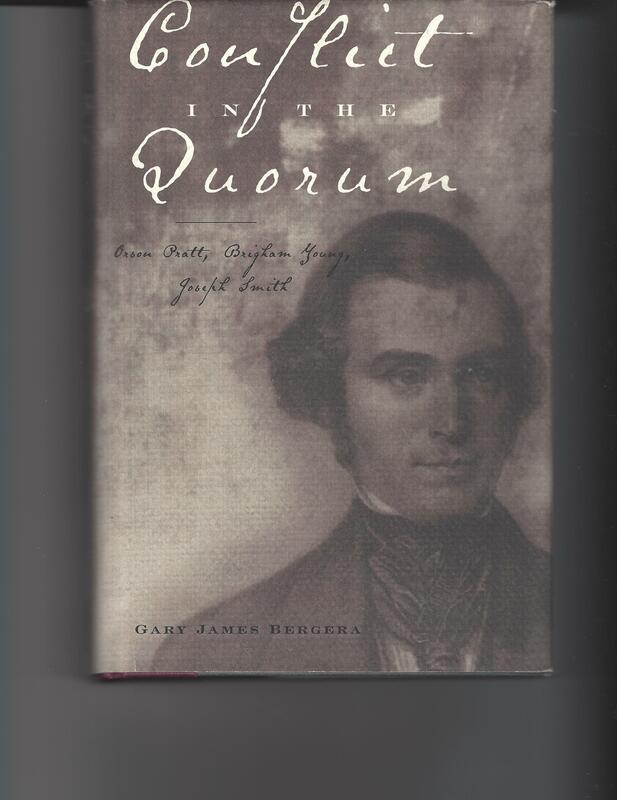 Review of Conflict in the Quorum: Orson Pratt, Brigham Young, Joseph Smith (Salt Lake City: Signature Books, 2002). Forget the idea that general authorities in the LDS Church have always gotten along. If anything else, reading Conflict in the Quorum by Gary James Bergera will certainly take care of that idea. In fact, this book shows how Orson Pratt—who should have been next in line for the LDS presidency after second President Brigham Young passed away in 1877, provided that Pratt had not been bumped two years earlier in a political maneuver—clashed with the “Brethren” over the course of his church career, including heated head-to-head disagreements with Young himself. While Sarah had kept silent about his earlier advances, now infuriated, she complained to Orson who immediately confronted Smith. The prophet denied the story . . . Faced with having to choose between his wife’s charges and Smith’s denials, Pratt, who by now much have heard rumors of the prophet’s plural marriages, sided with Sarah. . . .Orson first learned about polygamy from his wife because of her anger over Smith’s advances (pp. 18-19). It was Pratt’s initial opposition to plural marriage that got him into trouble with the higher leadership. One day Smith was approached by apostles Young, Heber C. Kimball, and George A. Smith, all of whom knew about Smith being a rabid philanderer. The men spent several days with Pratt but could not get him to change his mind. According to Young’s autobiography, Pratt’s “mind became so darkened by the influence and statements of his wife, that he came out in rebellion against Joseph, refusing to believe his [Joseph’s] testimony or obey his counsel” (p. 26). However, “Pratt would not yield, preferring to ‘believe his wife [instead of] the Prophet.’ At some point, Joseph reportedly told Orson that ‘if he did believe his wife and follow here suggestions, he would go to hell’” (Ibid). Thus, on August 20, 1842, the three apostles cut off Pratt–though Bergera points out it was not an official excommunication–from the church and replaced him with Amasa Lyman, who was later excommunicated. Pratt was reinstated to his position the following year and, in December 1843, received his “second anointing,” which is a guarantee of celestial glory in the next life. But the damage had been done. This episode ultimately cost Pratt the highest position in the church more than three decades later. The calling to be a spokesman for the church in the nation’s capital was a logical step. The irony of the articulate apostle’s role in defending polygamy given his devastating experience with it ten years earlier went unnoticed. Among the best educated and most intellectually minded of Mormonism’s leaders, Pratt had emerged as a formidable apologist, perhaps second only to his brother Parley (p. 86). Adam was known as Michael in a pre-earth existence. As Michael, he helped to create the earth and fathered all human spirits, as well as the physical body of Jesus Christ. Michael/Adam is thus, as Young taught, both the father of all humankind and, in the pantheon of gods, its reigning deity (p. 95). The cautious, double-edged tone of Pratt’s apology set the stage for further confrontation with Young. Pratt would simultaneously submit to the demands of his president yet tenaciously retain the right to think freely. . . . His reluctance to renounce error would be the most significant cause of Young’s continued criticism (p. 109). He also further condemned Pratt for his teaching that Adam was not God but rather was created out of the dust of the world. is our Father. . . Adam is the Father of our spirits. He lived upon an earth; he did abide his creation, and did honor to his calling and Priesthood . . . I reckon that Father Adam was a resurrected being, with his wives and posterity . . . I will tell you when you see your Father in the Heavens, you will see Adam. When you see your Mother that bear[s] your spirit, you will see Mother Eve (pp. 117-118). Young believed that matter was eternal and that God could progress in knowledge. Pratt appealed to the Bible as well as Smith’s revelations to support God’s omniscience, but Young replied, “I have had so much to do, that I have not read the Bible for many years” (p. 116). Ahh, perhaps that was the trouble! Young was busy making doctrine and ignoring the source from which doctrine ought to come. Young turned to Pratt and asked if he believed that “intelligent beings would continue to learn to all Eternity . . . . With customary frankness, the fearless apostle responded that ‘[h]e believes the Gods had a knowledge at the present time of evry thing that ever did exhist to the endless ages of all Eternity. He believed it as much as any truth that he had ever learned in or out of this Church” (p. 126). “Elder Orson Pratt pursued a Course of Stubbornness & unbelief in what President Young said that will destroy him if he does not repent & turn away from his evil way. For when any man crosses the track of a leader in Israel & tryes to lead the prophet[,] he is no longer lead by him but is in danger of falling” (p. 127). That summer Pratt was sent to England to become a mission president, but “despite reassurances to Young that he would avoid (controversial) topics, Pratt again outlined his concept of God and his divine attributes, appending an additional commentary on the nature of the Holy Spirit (p. 129). When Young later saw a pamphlet that Pratt had written on the Holy Spirit, he condemned Pratt’s “theories,” saying his was “lariatting” (lassoing) the gods and warned that “if he [Pratt] did not take a different course in his Phylosopy & order of reasoning[,] he would not stay long in this Church” (p. 130). Bergera does a good job in these pages to show how Pratt stubbornly contradicted the president, which infuriated Young. One time Pratt did make a public confession that he had “done wrong,” but “Pratt’s Sunday confession actually exacerbated, rather than resolved, their differences. Young was upset by what he believed was Pratt’s intentional misrepresentation of his teachings, that Pratt had said he worshipped a God who could not logically exist and who probably did not exist scripturally. Nor had Pratt admitted that he had taught false doctrine” (p. 170). Pratt was twice censured by Young in 1860 and 1865; in addition, his son Orson Jr. was excommunicated, which Young blamed on his father. Old age tempered their disagreements in the final decade of Young’s life, but there was an incident in 1868 that caused more strain. Joseph Smith’s Inspired Version of the Bible had been printed by the RLDS Church in Independence, MO, and Young asked Pratt to review it. According to Bargera, “Pratt either overstepped Young’s mandate or reached the wrong conclusions when on at least two occasions he publicly expressed approval of Smith’s Bible. . . . Pratt and Young knew that Smith’s version of the Bible supported Pratt’s belief in the creation of Adam from the dust of the earth—a position Young’s Adam-God teaching rejected” (pp. 251-252). I believe that God knows all things and that his understanding is perfect, not ‘relative.’ I have never seen or heard of any revealed fact to the contrary. I believe that our Heavenly Father and his Son Jesus Christ are perfect. I offer no excuse for the simplicity of my faith” (emphasis in original) (p. 282). Meanwhile, the Inspired Version of the Bible (or, the Joseph Smith Translation) is considered accurate by today’s Latter-day Saints, with current Bibles published by the church containing notes from Smith’s work. In addition, Pratt stood up for Smith’s biography written by Smith’s mother, Lucy Mack Smith, even though Young abhorred the book, and it is considered accurate by Latter-day Saints today. Back in the early days of Mormon leadership, disagreements were vocalized. Differences were not well hidden. Today, one has to wonder if the “Brethren” are always on the same page, as is the appearance given. Or is it possible that there are theological debates behind closed doors and agitation between the leaderships? Unless somebody were to exit the leadership, the answer is most likely the public will never know.